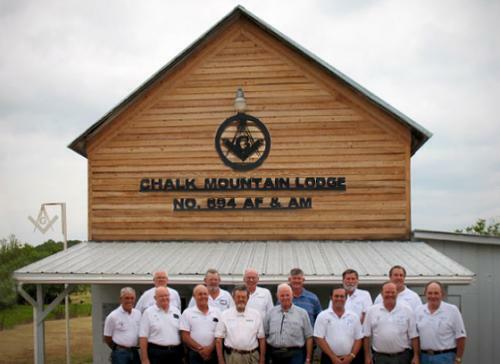 Chalk Mountain- If you blink you your eyes, you’ll miss Lodge No. 894. But, even if you see it, you’ll probably think it’s not used anymore. It is … barely. It’s wedged inside the upstairs of an old, wooden frame building. That’s why you’ll probably doubt that the loge exists. The building looks more like a monument of yesterdays fading into time than the home of a lodge. “Ha. Ha. Yeah, most people think it’s an oddity when they see it (the lodge building). I guess I would too if I weren’t so used to seeing it. But it would be an oddity to me if it weren’t there,” says Roy Underwood, one of the members. Underwood, who at 78 says he quit paying attention to his age when he realized he wasn’t getting any younger, says his uncle built the building. “When he was building it, they wanted to put a lodge on top and that was fine with Uncle Jim because from the top on up was what cost the most to build,” he says. So the upstairs became the Lodge. Downstairs was his uncle’s store in Chalk Mountain, which today is little more than a memory on Highway 67 in the eastern part of Erath County. Underwood, whose house is a short distance from the lodge, grins as he recalls what the store was like.” That’s where I stole my first candy, me and my cousin would come over here and sometimes when my uncle would leave to make the rounds of the city, we would fill our pockets with candy,” he says. He laughs and begins leading the way to the lodge. A pile of tops from cedar trees, thick and green, are burning in a nearby rock grate. The smoke and smell is heavy… as Underwood talks about Chalk Mountain. “This town, oh it was like all the other little bergs. It was serving a purpose. Then the Model T came and it took the people to towns and these little bergs dried up.” He is on the steps leading upstairs. Below is the part that used to be the store. Large telephone pole braces are holding up the top floor. Underwood pauses a moment. He is chewing tobacco. He has the country man’s hands–cracked, lined, thick and strong. One feels he could almost twist the padlock off if he wants to. He says the land on which he is standing was owned by his grandfather, a Civil War veteran. He came home from the war with two wounds but lived to be quite old. Underwood opens the door, flicks on a light switch and leads the way upstairs. The steps are in good condition, but creak with age. “How many members…Hell, I don’t know, really I think we have about 30,” Underwood says. He’s upstairs now where the members meet once a month, or when the moon is full. The wooden walls have remnants of what apparently was once bright wall paper. It’s torn and hanging in strips. The ceiling is wooden and there’s an old wood stove for heat. Some of the windows are broken. Sitting near the chairs are several coffee cans that are used for spittoons. Underwood scores a bulls eye in one with his dark stream of tobacco juice. There is a certificate hanging on the wall. It says the lodge was chartered on Dec. 8, 1904. Underwood puts on an old top hat. He looks like a movie character actor as he walks around wearing the hat. His deep, brown colored eyes are dancing in the fading light. A bee is trying frantically to find its way outside of one of the window panes. Dirt daubers have made nests in the ceilings and on some of the walls. “Oh, I enjoy this lodge. I know all of the members and I usually know who will be here. Lots of times, since this thing has become such an antique, we have more visitors than we do members in attendance. I guess they get a kick out of the antiquity.” Underwood says. He leads the way outside. The padlock snaps loudly. Underwood stands back and looks at the old building. “Yes sir, I would really miss this place, he says. The wind catches his words and carries them down to some cedar brakes edging out from the nearby pocket of hills. A full moon is just coming up. It looks like a pocket of chalk dust framed in slow motion camera action. When the members step outside their houses tonight and look at the moon, they’ll know it will soon be meeting time.